Friday night started out on a great note at Webster Hall with Ra Ra Riot. I arrived there quite early and had a prime spot right in the front center. I’m slowly beginning to feel tho, that maybe they just arent ready for it all yet. The music still sounds as great as ever, but it just feels like they’re lacking something on stage. The 2 women in the band seemed nearly afraid of the crowd. Perhaps they’ve just been touring too much and need to take a break. Regardless, the new Kate Bush cover sounds quite good, but it doesn’t have the same catchiness as “Hounds of Love”. The drummer was good as well and it seems he’d make a fine replacement for John Pike. The next band up was Biffy Clyro from Scotland. The first thing I noticed about the band was that they had die-hard fans who came out just to see them. A group of guys from Ireland were so excited to be seeing them, it was quite contagious. Now, I will start this out by saying Biffy Clyro is not someone I would normally listen to. It seemed an odd mix to put them between editors and Ra Ra Riot, two indie-pop/britpop bands. Biffy Clyro’s sound check was so loud I thought my ears might die. But when they came out to play it wasnt quite so loud. Or maybe my ears had adjusted. Some of the songs were quite easy to get into, but the loud, scream, noise heavy band was definitely not my cup of tea. The drummer and lead-singer (brothers), played with their shirts off. The lead singer has a collection of tattoos that range from everything from images to words. The band was very talented, and they could sure play those guitars. It was great fun to watch. The highlight of the night – and probably one of my favorite shows from this year was editors. I became very addicted to the new album – An End Has a Start – , so I really couldn’t wait to see the band. Tom came out and right away jumped into Bones. What a track to start the night. The night continued with a set-list that I would say were some of their best songs. Tom is very expressive with his hands, as he’d hold them out and wrap them around him. The crowd loved him and he played it up for the audience. His songs on the piano, enmeshed with his guitar were absolutely amazing. 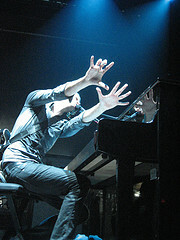 Watching his hands fly across the keys was pretty impressive. It was easy to see how truly talented he was. The lead guitarist is an incredible player and its easy to forgot how much of the music he actually plays. The bassist on the other side of the piano, and nearly cut off from the band held his own and would often times go back towards the drummer and play facing him. When the 4 of them came together in the back of the room (bad pun), it was easy to see how they fed off of each other. The energy was there and in each song you could feel the energy emanating in the room. The more popular songs were huge hits with the audience with everyone singing and jumping, and heads bopping along. I thought ‘Blood’ sounded amazing and one of my favorite songs ‘All Sparks’ was impressive. ‘Fall’ was as beautiful as it gets. Tom’s voice is so impressive live – it cant even compare with the recorded song. I am shooting myself that I am only seeing them once on this tour, because their new music is great. “When Anger Shows” is incredible live with the emotion all over Tom’s face and in his hands. Set list is listed below. If you haven’t yet seen editors, do yourself a favor and see them soon! They will not be this small forever. I keep thinking how impressive it would be to see Coldplay and editors play together. Similar styles and incredibly talented lead singers. Just might be a dream show. Video and photos to be added in the next day. This entry was posted on September 10, 2007 at 3:55 pm	and is filed under Adventures in the Big City, Friends, Live Music. You can follow any responses to this entry through the RSS 2.0 feed. You can leave a response, or trackback from your own site. Amazing setlist. Will see them tomorrow @ Debaser, Stockholm. I really love EDITORS´music, but I live in Mexico, and they don´t come here. I´m sad about it but I hope one day, they will come. Don´t you know when do they come?